These bright red Japanese chochin, or lanterns, can be seen displayed outside ramen stalls and restaurants throughout the country. These bright red Japanese chochin, or lanterns, can be seen displayed outside ramen stalls and restaurants throughout the country. Originally a Chinese import, these days ramen is probably Japan's most popular fast food and comes with a variety of toppings on salty noodles served in a broth and slurped. Traditionally covered with paper, these days commercial chochin are made of tough vinyl to withstand the elements. 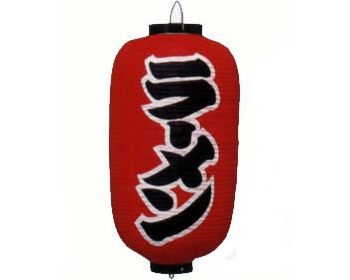 This is the perfect item to add that Japanese touch to your room, home or business. Note: when opening for the first time, it's best to do so in a warm (and preferably humid) area to loosen up the vinyl.